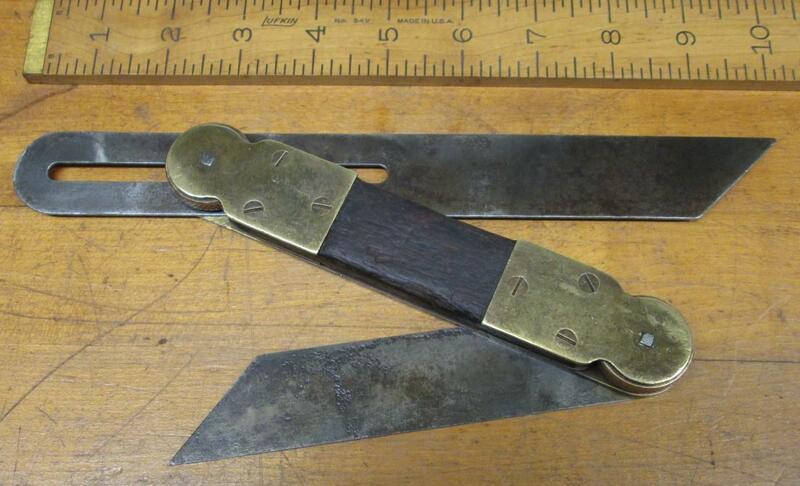 This is a very rare bevel gauge with double steel blades. It is unique and very well made! It is not marked by the maker, or owner, and there is no patent dates marked on it. One past owner told me he found it in the eastern U.S.A., perhaps made in that area. The main body has two layers of brass with a sandwich layer of rosewood, or similar hardwood. Also sandwiched in-between the brass plates are two knurled threaded wheels that loosen or tighten one blade each. There is also small holes drilled horizontally into the brass wheels to allow the user to insert a pin to tighten more or loosen the blade if it was tightened too tightly for finger pressure alone. 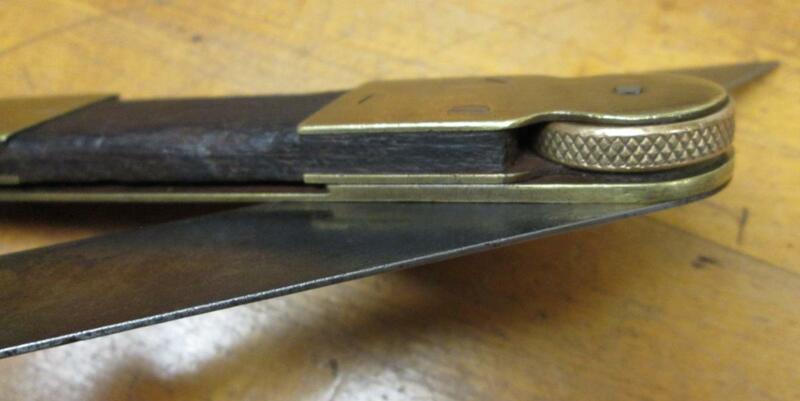 The threaded brass wheels are very affective and do hold the blade tight in place, even with finger tightening. One steel blade is 10" long, the other is 6" long, both are about 1.2" wide, both are steel. As you can see in the photos, the steel blades are clean, no rust, reasonablely straight with, functional, with some minor darkening and light pitting here and there. The rosewood has some wear, a few dings, and the two edge corners are rounded over to some extent. It is very possible that this is a prototype tool, or toolmaker made for a particular use, as this bevel appears to had plenty of careful use over the years. 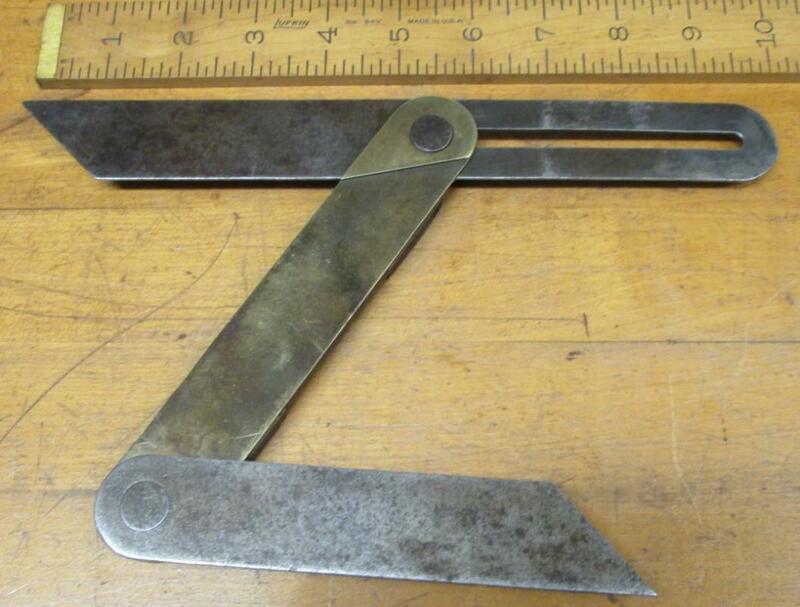 I was not able to find a similar patent on this tool, so I have no idea at this point where it was made or who made it, but clearly it was made to speed layout of multi-bevel angles and I am sure it was designed to be a time saver. A very nicely made tool, very well constructed! Items Similar To "Bevel Gauge Double Blade Unique"
Shelton Jack Plane No. 14 Nice!